World War I, known as the "war to end all wars," occurred between July 1914 and November 11, 1918. By the end of the war, over 17 million people had been killed, including over 100,000 American troops. While the causes of the war are infinitely more complicated than a simple timeline of events, and are still debated and discussed to this day, the list below provides an overview of the most frequently-cited events that led to war. When Austria-Hungary declared war on Serbia, Russia got involved to defend Serbia. Germany, seeing that Russia was mobilizing, declared war on Russia. France was then drawn in against Germany and Austria-Hungary. Germany attacked France by marching through Belgium pulling Britain into war. Then Japan entered the war. Later, Italy and the United States would enter on the side of the allies. Imperialism is when a country increases their power and wealth by bringing additional territories under their control. Before World War I, several European countries had made competing imperialistic claims in Africa and parts of Asia, making them points of contention. Because of the raw materials these areas could provide, tensions around which country had the right to exploit these areas ran high. The increasing competition and desire for greater empires led to an increase in confrontation that helped push the world into World War I. As the world entered the 20th century, an arms race had begun, primarily over the number of each country's warships, and the increasing size of their armies—countries began training more and more of their young men to be prepared for battle. The warships themselves increased in size, number of guns, speed, method of propulsion, and quality armor, beginning in 1906 with Britain's HMS Dreadnought. Dreadnought was soon out-classed as the Royal Navy and Kaiserliche Marine quickly expanded their ranks with increasingly modern and powerful warships. By 1914, Germany had nearly 100 warships and two million trained soldiers. Great Britain and Germany both greatly increased their navies in this time period. Further, in Germany and Russia particularly, the military establishment began to have a greater influence on public policy. This increase in militarism helped push the countries involved into war. Much of the origin of the war was based on the desire of the Slavic peoples in Bosnia and Herzegovina to no longer be part of Austria-Hungary but instead be part of Serbia. This specific essentially nationalistic and ethnic revolt led directly to the assassination of Archduke Ferdinand. But more generally, nationalism in many of the countries throughout Europe contributed not only to the beginning but to the extension of the war across Europe and into Asia. As each country tried to prove their dominance and power, the war became more complicated and prolonged. 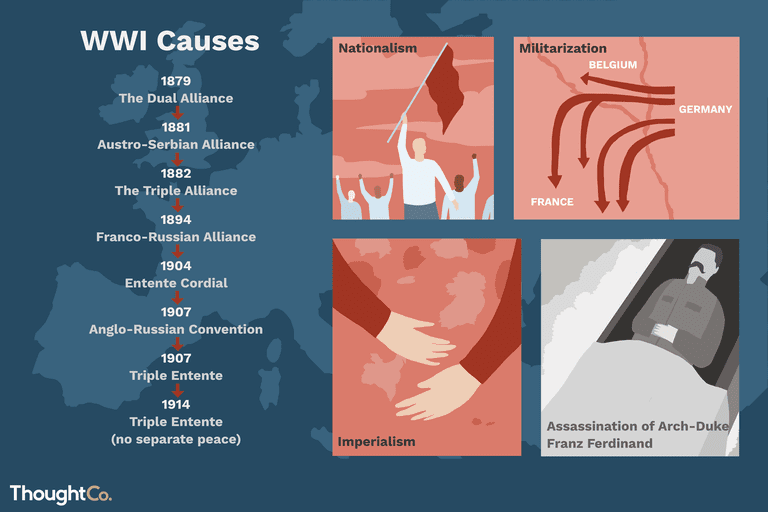 The immediate cause of World War I that made the aforementioned items come into play (alliances, imperialism, militarism, and nationalism) was the assassination of Archduke Franz Ferdinand of Austria-Hungary. In June 1914, a Serbian-nationalist terrorist group called the Black Hand sent groups to assassinate the Archduke. Their first attempt failed when a driver avoided a grenade thrown at their car. However, later that day a Serbian nationalist named Gavrilo Princip shot the Archduke and his wife while they were driving through Sarajevo, Bosnia which was part of Austria-Hungary. They died of their wounds. The assassination was in protest to Austria-Hungary having control of this region: Serbia wanted to take over Bosnia and Herzegovina. The assassination of Ferdinand led to Austria-Hungary declaring war on Serbia. When Russia began to mobilize to defend its alliance with Serbia, Germany declared war on Russia. Thus began the expansion of the war to include all those involved in the mutual defense alliances. World War I saw a change in warfare, from the hand-to-hand style of older wars to the inclusion of weapons that used technology and removed the individual from close combat. The war had extremely high casualties over 15 million dead and 20 million injured. The face of warfare would never be the same again.